*/JY 31 09 on horiz. 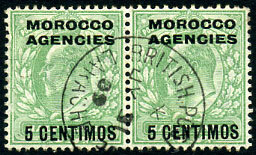 pair GB ovp'd KE7 5c on ½d (SG.112). A/4 OC 24 on vertical pair GB ovp'd KGV 10c on 1d (SG.130).